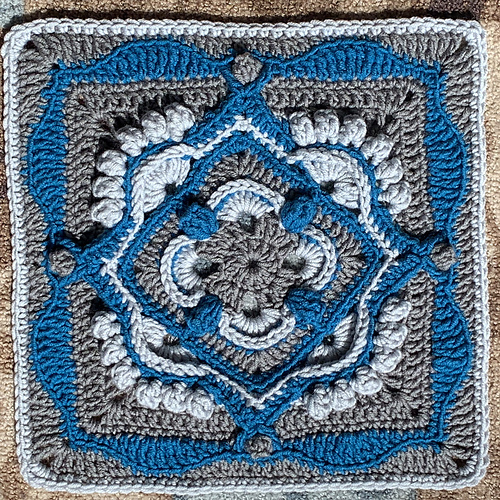 Welcome to Week 13 of our 2019 Block of the Week Crochet Along. I am pleased to see so many of you chatting and sharing photos on my Ravelry board and my Facebook Crochet-A-Long group. Feel free to jump in any time. Please use hashtags #BAWJ2019 and #crochetalongwithJulieanny. This week I am excited to announce a beautiful square by a prolific and talented crochet designer – Melinda Miller. Found on her blog, mocrochet.blogspot.com, My April Fool is hands-down my favorite Melinda Miller design yet, and that’s saying something. Melinda has designed such classic afghan blocks as More V’s Please, Pizzazz, and Autumn Square , as well as blankets, crochet alongs, and themed block series. Melinda has a Ravelry group called Melinda Miller Designs and a Facebook group called Crochet Time with Melinda Miller Designs. I am loving my current yarn choice, Color Made Easy by Lion Brand, a bulky weight acrylic (#5) that I am stitching with a K hook. Each block is 16″ so I will have a blanket in no time! The yarn is squishy and fun to work with, and it is on clearance now at Michael’s website, for only $2.97, regularly $7.99. I just bought a bunch. Have you purchased your CAL bag yet? Mailing out almost every day – my custom heavy-duty canvas tote bag. NEW: For the bag alone without included patterns, see this Etsy listing. For a free bag with pattern purchase see here for more information.